In the Pacific Northwest, most fields of winter wheat have passed the flowering stage, and some winter wheat fields have reached the ripening stage. In general, winter wheat crops are in good condition and stripe rust is under control. In contrast, stripe rust has developed to the highest severity level on susceptible varieties in our experimental fields in Lind (Adams County), Walla Walla (Walla Walla County), and Pullman (Whitman County), Washington. (Figure 1). For spring wheat, most areas have reached the critical time for managing stripe rust, as crops have been approaching flowering. In commercial fields, stripe rust is quite low but could develop fast. In our experimental fields in Lind and Walla Walla, stripe rust reached flag leaves and up to 60% severity on susceptible varieties (Figure 2). In our Pullman fields, spring wheat is at the middle jointing stage (Feekes 6) and stripe rust is heavy on low leaves of susceptible varieties. Figure 1. Stripe rust of natural infection in a rainfed experimental winter wheat field near Pullman, Washington (photo taken on June 11, 2018). Figure 2. Stripe rust of natural infection in an irrigated experimental spring wheat field near Lind, Washington (photo taken on June 14, 2018). The weather has been favorable for stripe rust development. The widespread precipitation on June 9 and 10 and the dew-forming conditions at the subsequent nights created moist conditions for stripe rust pathogen to infect wheat leaves. From the infections during the last week, stripe rust will show up in the next two weeks. Some areas may have got showers today, which will allow new infections. Thus, in the next three weeks, stripe rust will increase in fields grown with susceptible and moderately susceptible spring wheat varieties. The general recommendations are the same as those made previously. Only fields grown with susceptible and moderately susceptible varieties (ratings 5-9) or fields with easily found rust pustules (5-10% incidence) need fungicide application. 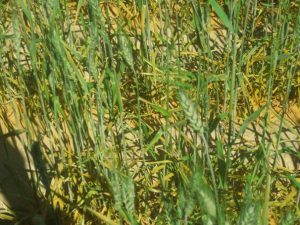 For winter wheat crops that are grown in high elevations and have not reached the flowering stage, stripe rust can still be a concern, and fungicide application may be needed if active rust pustules can be easily found. Most fungicides are labeled for use before the flowering time (Feekes 10.5). Do not use fungicides after the labeled stage. For spring wheat, if fungicide was not used at the herbicide application, fungicide application may be needed for the fields grown with susceptible and moderately susceptible varieties when active rust is found. For fields that have been applied with a fungicide, check the fields three to four weeks after the fungicide application for active rust pustules and consider a second application of fungicides before flowering. 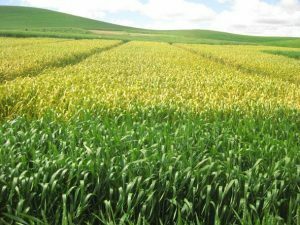 Barley stripe rust has occurred in Mount Vernon (Skagit County), WA and Corvallis (Benton County), OR in the western Pacific Northwest. In the eastern Pacific Northwest, barley stripe rust was observed in the past week in Lind, Walla Walla, and Pullman, WA. So far, barley stripe rust has been found only in experimental fields. In general, fungicide application is not necessary unless active rust is easily found (5-10% incidence) in the field. So far, wheat stripe rust has been reported in 20 states (Arkansas, Texas, Oregon, Washington, Mississippi, Georgia, Tennessee, Oklahoma, Louisiana, California, Kentucky, Kansas, Illinois, North Carolina, Virginia, Idaho, Michigan, Illinois, Montana, and New York). In general, wheat stripe rust has been at relatively low levels compared to this time of the last year. However, the rust season is not over for the northern states, and we still need to keep eye on the wheat fields.